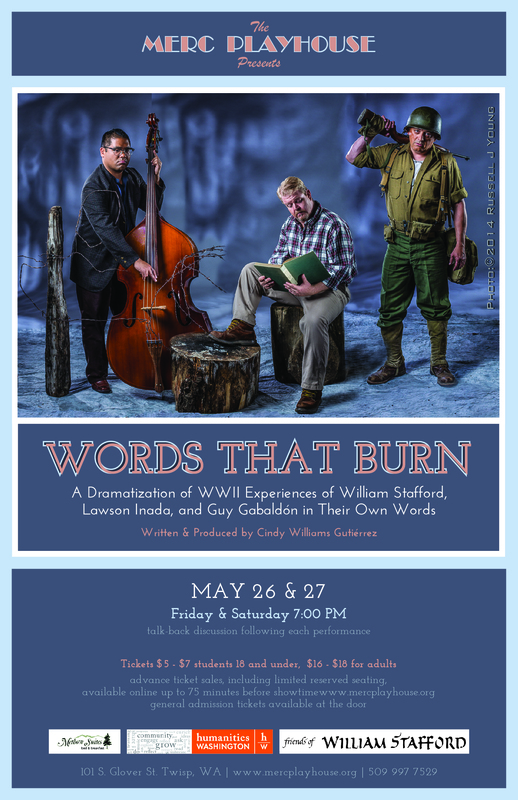 Words That Burn is a dramatization of the WWII experiences of conscientious-objector William Stafford, Japanese-American internee Lawson Inada, and East Los Angeles Marine Guy Gabaldón in their own words. In partnership with the Merc, playwright Cindy Williams Gutierrez will bring the Portland cast to Twisp for these two public performances as well as a special student matinee for Liberty Bell High School sophomores and juniors. The student matinee is made possible by a generous grant from the Friends of William Stafford and from William and Joy Howe of Portland, Oregon. Methow Arts is sponsoring an poetry residency through their Artist-in-Residence program so that the playwright can work with the students to prepare them for the show. Each performance will be followed by an artist talk-back moderated by scholar John Roth. Words That Burn received the 2017 Oregon Book Award for Drama. DATES: Fri, May 26 and Sat, May 27, 2017 at 7 pm. LOCATION: Merc Playhouse in Twisp. TICKETS: $5-$18, order online here. INFORMATION: www.mercplayhouse.org/happening-now.html.